Abraham had three wives. From his concubine Hagar the Egyptian was descended Ishamel and IJ y-dna. From his wives Sarah and Keturah would descend Isaac and the six sons of Keturah- Zimran, Jokshan, Medan, Midian, Ishbak and Shuah. 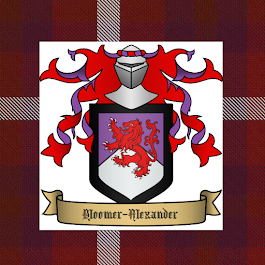 Abraham received the L15/M523/PF3492/S137 marker which are found in all his descendants. The markers or mutations that distinguish Abraham and his brothers may have occurred in their families as group mutations due to increased radiation from the cataclysmic events of the destruction of the cities of the Plain which from then on they passed to their male offspring. The sons of Keturah and Isaac have the M9 Marker associated with K. Abraham's son who was conceived and born before the cataclysmic events of the destruction of Sodom and Gomorrah did not have M9 whereas all his sons born after these events did. They also all had the marker for K2 which is M526 except for one son Medan who only had the M9 marker but not the M526 marker. Isaac was the first of Abraham's son to have the K-M9 and K-M526 but he only passed them both to Jacob whereas Esau was missing the K-M526 marker but received the M429/P125 (IJ). Sometimes a descendant will be missing a marker or a marker will enter their y-dna though their mother's lineage. This has happened with the sons of Jacob. 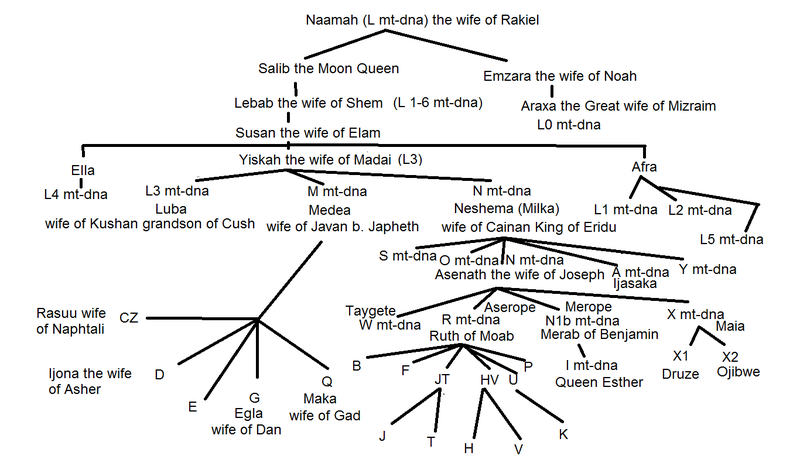 His wives by Bilhah and Zilpah have certain different markers than their half brothers of R and Q y-dna. This is also why N and O seem to descend from K2a which is the haplogroup of Zimran. I have proposed calling this group U y-dna. Naphtali and Dan have genetically inherited the y-dna markers of K2a (U) which is M2308 and K2a1 which is M2313. They have received this through their mother Bilhah's autosomal dna which entered their y-dna from her mother Zambrah the daughter of Zimran. 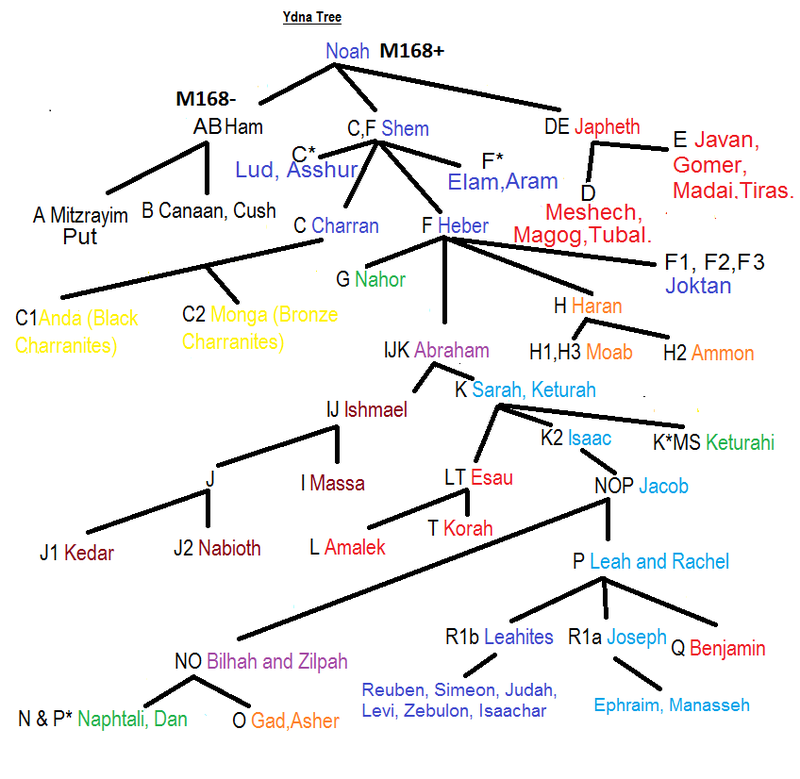 Jacob's son Benjamin didn't receive the markers for R (M207) and R1 (M173) y-dna like his brother Joseph and his half brothers who were the sons of Leah. 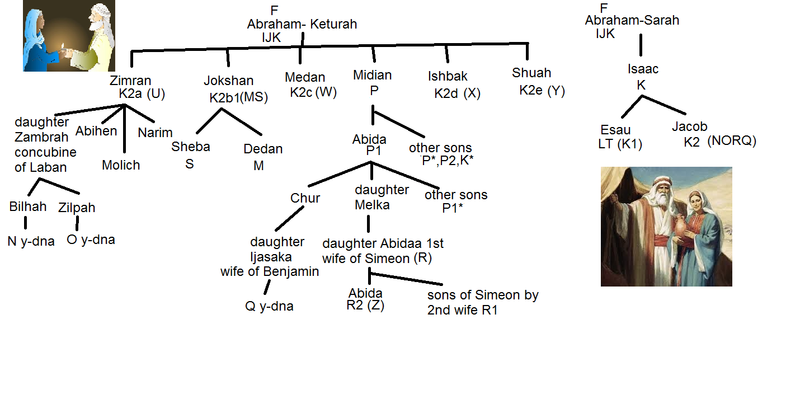 Rachel and Leah passed the markers for P (P295) and P1 (M45) from their maternal grandfather Abida Prince of Midian (whose daughter was Adina the wife of Laban), through their autosomal dna which entered the y-dna of all their sons by Jacob. 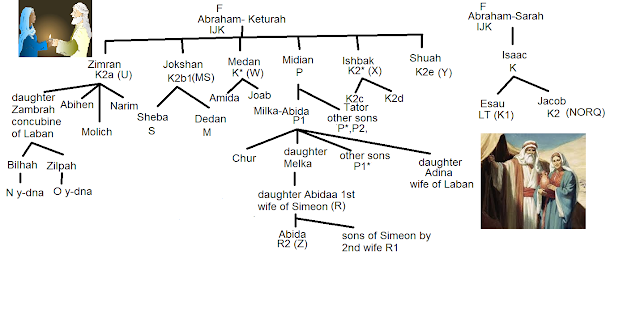 Many believe that Abraham's wife Keturah was dark skinned or black. However she may have not been black but her sons as they moved further into the east married darker skinned women. Today many of her descendants are black and live in India, South-East Asia and Australia. I also believe that K* found among Australian aborigines descends from Medan's son Joab or Joav. This is the origin for the name Java or Jabba for Australia. The K* y-dna ancestors of the Australian Aborigines lived both in Lesser Java (on the now sunken Kerguelen Plateau) especially the Medang Kingdom but also as the ruling class of the Kingdom of Singhasari that included the (now sunken) southern half of Indonesian Java called Sunda and the northern coast of Western Australia (Sheba) much which is also now sunk under the sea. They mixed with the C y-dna ancestors of the Australian Aborigines who made up the bulk of the population of Lesser Java (Java Minore) which was transferred to Greater Java (Australia) and South East Asia around 1530. C and F ydna originated in ancient Western Australia and during the Ice Age a large group of C that had intermarried with the daughter of Nahal (Denisovan) lived in South America. At the end of the Ice Age they moved via Antarctica to the Kerguelen Plateau. It is from there that black C y-dna entered India and Australia. Thus the circumcision custom of the Australian Aborigines come from the K* y-dna ancestors who were sons of Abraham and Keturah whereas the uncircumcised custom originated with the C y-dna descended from the black sons of Anda son of Charran son of Arpachshad. "It is not certain that the SLC24A5 mutation conferring fair skin arose within haplogroup R. The Mal'ta boy (Y-DNA R*) didn't have it... Considering the very dark skin of R2 populations in Southeast India and Southeast Asia, it surely wasn't present among the original R2* lineages either. Based on its equally strong association with modern R1a and R1b populations, it is far more likely to have arisen among R1 carriers. Nonetheless it could just as well have been picked up in another population and been transmitted to R1a and R1b men through the maternal side." In fact they received this gene through their mothers whose father was called Laban which means white. This gene seems to be not passed on when the white men would marry into the black skinned descendants of Ham and Nahal (Denisovan). Many Australian Aborigines descend from the sons of Keturah and are thus also sons of Abraham. It would seem that God himself has allowed the different groups to receive an identifying mark in their genes so that when Elijah comes he will restore each person to their lost Tribal identity. 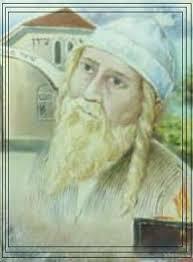 In a sense the study of genetics is a Elijah project.